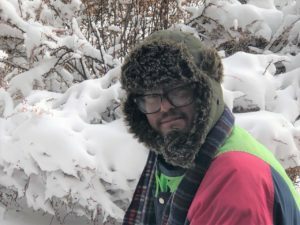 Every quarter, Evergreen Service Providers honors a Host Home Provider (HHP) for their work in supporting the adults with Intellectual and Developmental Disabilities (IDD) in their care. Tim and Rose Whitfield are two of those exceptional people. They’ve been with us for two years, and opening their home to others is nothing new. With a young son who was interested in a brother or sister, they made the decision as a family to share their home with foster children. Over a period of twelve years, they made numerous children a part of their family, working primarily with teenagers who were dealing with behavioral issues. Rose has even done training for those who wish to become foster parents. After taking a respite from foster care and becoming empty nesters when their son graduated and moved out on his own, Tim and Rose learned from a friend about the Host Home Provider program for IDD adults. It is in their nature to give back and something they consciously choose to do, so they began the process of becoming HHPs. About two years ago, Tim retired from his work as a mechanical engineer. At about the same time they learned about Michael and his need for a Host Home Provider. Although Rose still works outside their home, they were soon sharing their home with Michael. Their years as foster parents prepared them well for working with and helping him. In his forties, Michael came to them not only with diabetes and other physical illness but behavioral issues as well – into which Tim and Rose have great insight. Realizing that some of Michael’s behaviors were choices and some related to his physical illness, they addressed his medical issues right away. Recognizing that some of his behaviors came from a lack of self-esteem, they have encouraged Michael to “just be who you are – don’t try to be somebody else.” Rose says that establishing mutual respect has been an important tool in addressing his behavioral issues which, as a result of their understanding of his issues and a consistent approach, are subsiding. Tim and Rose say that their objective is to help Michael reach his goals and “be the man he wants to be.” He would eventually like to have a job and a bank account. They have enrolled him in a math class and Tim works with him regularly on those skills which Tim, as an engineer, knows he can’t do without if he is going to become more self-sufficient. Michael attends a day program through which he visits museums, malls, and his favorite, libraries, where he has learned the basics of using a computer. When Michael is not in his day program, he goes everywhere with Tim and Rose – to restaurants, stores, movies, and accompanies Tim to appointments. Michael willingly helps with chores at home including keeping his own room and bathroom clean. Tim and Rose hope to empower Michael to enjoy and eventually blend into society, becoming a contributing member of the community and being treated like everyone else, despite his disabilities. They say they get involved to give back and make a difference for someone. And clearly they have, over and over. 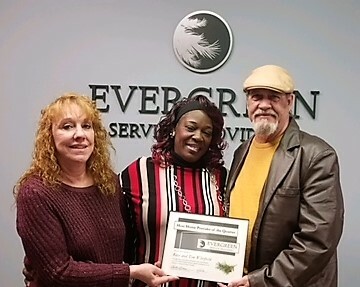 Congratulations, Tim and Rose, for being selected as Evergreen Service Providers’ Host Home Provider of the Quarter. And thank you for being a shining example of the fulfillment of Evergreen’s mission, which is to help Individuals with IDD thrive.